NEW LONDON, Connecticut, October 31, 2015 (ENS) – Coast guard agencies of the eight Arctic nations Friday officially signed a joint statement establishing a new intergovernmental security body – the Arctic Coast Guard Forum. Membership includes Canada, Denmark, Finland, Iceland, Norway, Sweden, the Russian Federation and the United States. The Arctic Coast Guard Forum is an “operationally-focused, consensus-based organization” that aims to leverage collective resources to foster safe, secure and environmentally responsible maritime activity in the Arctic. 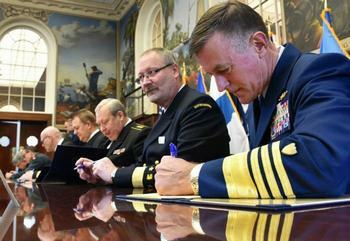 The signing ceremony is the result of months of collaboration by the U.S. Coast Guard and fellow agency representatives who crafted the Arctic Coast Guard Forum’s foundational documents, developed its operating framework, and convened official working groups. This complex process involved both military and civilian agencies. In Norway, for instance, the Coast Guard is part of the Norwegian Navy, while in Sweden the Coast Guard is a civilian agency under the Department of Justice. The historic summit of coast guard agency representatives took place at the U.S. Coast Guard Academy’s for Arctic Study and Policy. While participants spent the majority of their time focused on the work at-hand, they also met with Academy cadets, faculty and staff over lunch and during a panel discussion focused on the Arctic. During the summit, Department of Homeland Security Secretary Jeh Johnson and Coast Guard Commandant Admiral Paul Zukunft met with agency representatives and highlighted their collaboration in the Arctic domain. “Today’s historic Arctic Coast Guard Forum represents a critical step forward in our collective efforts to promote safety, security and environmentally-responsible maritime activity in the Arctic,” said Zukunft. “As the ocean becomes more accessible to human activity, all Arctic nations have committed to enhancing maritime cooperation in this remote and challenging environment,” Zukunft said. The Arctic region is getting more global attention due to climate change, which is melting the region’s permanent ice cover and intensifying competition for undiscovered resources and passage between the Atlantic and Pacific oceans to the north of North America. In September, at the end of its 2015 melt season, the Arctic’s ice cover fell to the fourth lowest extent in the satellite record, both in the daily and monthly average, according to scientists at the U.S. National Snow and Ice Data Center, NSIDC. The lowest Arctic extent on record occurred in 2012. Arctic sea ice has now been declining at a rate of 13.4 percent per decade relative to the 1981 to 2010 average. The nine lowest September ice extents over the satellite record have all occurred in the last nine years. “What we have seen this summer reinforces our conclusions that Arctic sea ice extent is in a long-term decline and that we are headed for a seasonally ice-free ocean,” said NSIDC Director Mark Serreze. These factors formed the basis of deliberations as members of the Arctic Coast Guard Forum came together in March to reach consensus on the forum’s operating principles, strategic objectives and rules of governance. 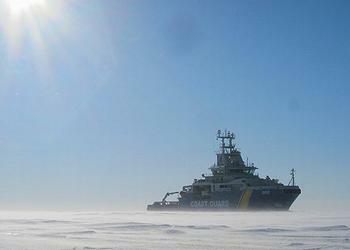 The Arctic Coast Guard Forum will reconvene for an Experts Meeting in the spring of 2016.